Covenant Eschatology [eschatology – study of the end times] is the teaching that God’s last-days scheme of redemption is not dealing with the transformation of the physical creation but a transformation of the covenants. The three, major futurist eschatological positions [premillennialism, amillennialism, and postmillennialism] hold that eschatology is concerned with the transformation of the physical creation in some fashion or another – whether that be simply the changing of physical flesh or even the transformation of the physical cosmos. These three positions teach that the coming of the Lord is at the end of the Christian age instead of teaching that the coming of the Lord was for consummating the Old Covenant age and thereby establishing the Christian age – also scripturally called the age to come. These three major belief systems are teaching an eschatology where the coming of Christ is working counterproductive to the death of Christ by believing that Jesus will one day bring to an end what He died to establish: the Christian age. Those in some premillennial camps even teach that the church was an institution that was not prophesied about by the Old Testament prophets, and that it is simply a place holder during the “Grace Dispensation” until God brings this age to an end and sets up an earthly kingdom in Jerusalem for a literal 1,000 years. Regardless of what futurist view that may interact with Covenant Eschatology, the charge is usually brought up that, to preterists, “it’s all about AD70.” What these critics fail to realize, is that Covenant Eschatology does not seek to diminish the Cross of Christ, but to magnify the Cross of Christ through teaching the true significance of Jesus’ death to the world below and ushering in, through His resurrection, the pathway into the world above. 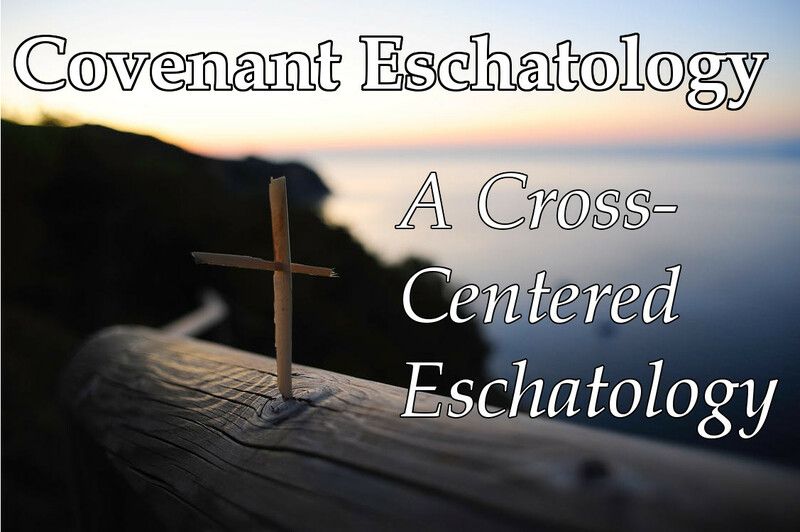 Covenant Eschatology seeks to teach a Cross-centered, Cross-determined eschatology where Jesus comes again to manifest what He died to establish. This article will serve as proof that true eschatology is Cross-determined – that is, Jesus’ work on the Cross works hand-in-hand with the purpose of His Parousia (“presence” or “coming”). As to this salvation, the prophets who prophesied of the grace that would come to you made careful searches and inquiries, seeking to know what person or time the Spirit of Christ within them was indicating as He predicted the sufferings of Christ and the glories to follow. It was revealed to them that they were not serving themselves, but you, in these things which now have been announced to you through those who preached the gospel to you by the Holy Spirit sent from heaven – things into which angels long to look. Therefore, prepare your minds for action, keep sober in spirit, fix your hope completely on the grace to be brought to you at the revelation of Jesus Christ. (1 Peter 1:10-13, NASB). The salvation, that was ready to be revealed in the last time, would come at the coming of the Lord. This salvation was prophesied about in the Old Testament, and it would be brought about by “the sufferings of Christ and the glories to follow.” The glories to follow are inseparable from the sufferings of Christ. These glories are Cross-determined. This “grace that would come” to the first century Christians that Peter was writing to, would be brought at the revelation of Jesus Christ. This connection between the sufferings of Christ and the glories to follow is seen in the book of Hebrews as well. Otherwise, He would have needed to suffer often since the foundation of the world; but now once at the consummation of the ages He has been manifested to put away sin by the sacrifice of Himself. And inasmuch as it is appointed for men to die once and after this comes judgment, so Christ also, having been offered once to bear the sins of many, will appear a second time for salvation without reference to sin, to those who eagerly await Him. (Hebrews 9:26-28). Jesus’ death and His second appearing cannot be separated from one another. They both are for the purpose of changing the ages with the goal of salvation. What was begun at the death of Jesus was consummated at His second appearing that would occur, from the perspective of the audience of the Hebrews epistle, in a “little, little while” (Hebrews 10:37). His death and His appearing are constrained to this time period called “the consummation of the ages” (συντελεια των αιωνων – sunteleia ton aionon). The disciples understood this in Matthew 24. Jesus came out from the temple and was going away when His disciples came up to point out the temple buildings to Him. And He said to them, “Do you not see all these things? Truly I say to you, not one stone here will be left upon another, which will not be torn down.” As He was sitting on the Mount of Olives, the disciples came to Him privately, saying, “Tell us, when will these things happen, and what will be the sign of Your coming, and of the end of the age [Greek: συντελειας του αιωνος – suntelias tou aionos]?” (Matthew 24:1-3). Jesus, in answering their question, indicated that the destruction of Jerusalem, the end of the Old Covenant age, and His Parousia would all take place within that generation (Matthew 24:14, 27, 34). “This gospel of the kingdom shall be preached in the whole world as a testimony to all the nations, and then the end will come” (Matthew 24:14). “For just as the lightning comes from the east and flashes even to the west, so will the coming of the Son of Man be” (Matthew 24:27). “Truly I say to you, this generation will not pass away until all these things take place” (Matthew 24:34). Jesus’ death and Parousia both played a crucial role in the transformation of the age. The Cross-event made the way for others to enter the world above, and His Parousia melted the elements of the then-present evil world. Just enough time was allowed between the birth and manifestation of the new age to allow “whosever will” to join the spiritual seed in the Exodus out of the world below where sin, death, and decay abound. This period of time is called in the parables a time of “delaying” and “a long time” to illustrate what Peter called the patience of God towards His people (Matthew 25:5, 19; 2 Peter 3:9). “The Lord is not slow about His promise, as some count slowness, but is patient toward you, not wishing for any to perish but for all to come to repentance” (2 Peter 3:9). In the Book of Revelation, the death of Jesus is connected to His manifestation. In no less than three places, Jesus is called the Lamb that was slain. It is His sacrifice that is emphasized because His sacrifice is inseparable from the things that were to “shortly come to pass” (Revelation 1:1, 3). “And I saw between the throne (with the four living creatures) and the elders a Lamb standing, as if slain, having seven horns and seven eyes, which are the seven Spirits of God, sent out into all the earth” (Revelation 5:6). “…saying with a loud voice, “Worthy is the Lamb that was slain to receive power and riches and wisdom and might and honor and glory and blessing”” (Revelation 5:12). “All who dwell on the earth will worship him, everyone whose name has not been written from the foundation of the world in the book of life of the Lamb who has been slain” (Revelation 13:8). “Therefore, behold, I am sending you prophets and wise men and scribes; some of them you will kill and crucify, and some of them you will scourge in your synagogues, and persecute from city to city, so that upon you may fall the guilt of all the righteous blood shed on earth, from the blood of righteous Abel to the blood of Zechariah, the son of Berechiah, whom you murdered between the temple and the altar” (Matthew 23:34-35). The End of Which Age? Cross-Determined or Not? A major difference between traditional eschatologies and Covenant Eschatology is the question of what age comes to an end at the Parousia of Christ. Many teach that the Christian age will one day come to an end. This may result in the end of material creation, Extreme Makeover Earth Edition, or reinstating fleshly Israel as a Covenant people after the rapture. Regardless of what position is taken, all have one thing in common, the Parousia of Christ ends the age that Jesus died to initiate. Covenant Eschatology, keeping in line with the scripture, teaches that Jesus came a second time to do away with the first in order to establish the second. “…then He said, “BEHOLD, I HAVE COME TO DO YOUR WILL.” He takes away the first in order to establish the second” (Hebrews 10:9). The first, speaking of the Old Covenant, was on the verge of passing away at the writing of this epistle. The Hebrews writer recorded, “When He said, “A new covenant,” He has made the first obsolete. But whatever is becoming obsolete and growing old is ready to disappear” (Hebrews 8:13). In fact, the dissolving of the Old Covenant was so close that the Hebrews writer encouraged his audience by writing, “Therefore Jesus also, that He might sanctify the people through His own blood, suffered outside the gate. So, let us go out to Him outside the camp, bearing His reproach. For here we do not have a lasting city, but we are seeking the city which is to come” (Hebrews 13:12-14). And when He had taken a cup and given thanks, He gave it to them, saying, “Drink from it, all of you; for this is My blood of the covenant, which is poured out for many for forgiveness of sins. “But I say to you, I will not drink of this fruit of the vine from now on until that day when I drink it new with you in My Father’s kingdom. (Matthew 26:27-29). It was through the shedding of Jesus’ blood that the first Covenant was passing away, and it would be His Parousia at the manifestation of the Father’s kingdom that would finish that change. From the perspective of the Hebrews writer, who was writing towards the end of the generation to which Jesus prophesied, the kingdom of God was being received and the heavens and earth of the Old Covenant economy were ready to vanish away (Hebrews 12:18-29). For you have not come to a mountain that can be touched and to a blazing fire, and to darkness and gloom and whirlwind, and to the blast of a trumpet and the sound of words which sound was such that those who heard begged that no further word be spoken to them. For they could not bear the command, “IF EVEN A BEAST TOUCHES THE MOUNTAIN, IT WILL BE STONED.” And so terrible was the sight, that Moses said, “I AM FULL OF FEAR and trembling.” But you have come to Mount Zion and to the city of the living God, the heavenly Jerusalem, and to myriads of angels, to the general assembly and church of the firstborn who are enrolled in heaven, and to God, the Judge of all, and to the spirits of the righteous made perfect, and to Jesus, the mediator of a new covenant, and to the sprinkled blood, which speaks better than the blood of Abel. See to it that you do not refuse Him who is speaking. For if those did not escape when they refused him who warned them on earth, much less will we escape who turn away from Him who warns from heaven. And His voice shook the earth then, but now He has promised, saying, “YET ONCE MORE I WILL SHAKE NOT ONLY THE EARTH, BUT ALSO THE HEAVEN.” This expression, “Yet once more,” denotes the removing of those things which can be shaken, as of created things, so that those things which cannot be shaken may remain. Therefore, since we receive a kingdom which cannot be shaken, let us show gratitude, by which we may offer to God an acceptable service with reverence and awe; for our God is a consuming fire. (Hebrews 12:18-29). This fits the inspired timeline that Jesus laid out within the Olivet Discourse. “So you also, when you see these things happening, recognize that the kingdom of God is near. ‘Truly I say to you, this generation will not pass away until all things take place’” (Luke 21:31-32). The things that disciples would seeing were things concerning the fall of Jerusalem in AD70 as the context reveals. While Jesus’ resurrection was the time when He began to sit on the throne during His pre-Parousia reign with His saints, it would be at His manifestation at the end of the Old Covenant age that the kingdom of God would be fully received and possessed by the saints of the Most High (2 Peter 1:11; Daniel 7:27). Now, the Lord’s Supper is taken with Jesus in the Father’s kingdom. No longer are we “always carrying about in the body the dying of Jesus…” (2 Corinthians 4:10). But the life that was once hidden with Christ in God is now “manifested in our body” (2 Corinthians 4:10; Colossians 3:1ff). We show forth the death and the life of Christ in this now-manifested New Covenant. The coming of the Lord wasn’t to do away with the things of the New Covenant such as baptism, the Lord’s supper, evangelism, etc., but it was to establish them! The reason why some believe the former to be the case is because they associate the coming of the Lord with the end of the wrong age. Did Jesus come to destroy what He died to establish? May it never be the case! Jesus came to finish the work that He began at the Cross and to remove those things that could be easily shaken. This was the hope of the first century saints. Are we beginning to commend ourselves again? Or do we need, as some, letters of commendation to you or from you? You are our letter, written in our hearts, known and read by all men; being manifested that you are a letter of Christ, cared for by us, written not with ink but with the Spirit of the living God, not on tablets of stone but on tablets of human hearts. Such confidence we have through Christ toward God. Not that we are adequate in ourselves to consider anything as coming from ourselves, but our adequacy is from God, who also made us adequate as servants of a new covenant, not of the letter but of the Spirit; for the letter kills, but the Spirit gives life. But if the ministry of death, in letters engraved on stones, came with glory, so that the sons of Israel could not look intently at the face of Moses because of the glory of his face, fading as it was, how will the ministry of the Spirit fail to be even more with glory? For if the ministry of condemnation has glory, much more does the ministry of righteousness abound in glory. For indeed what had glory, in this case has no glory because of the glory that surpasses it. For if that which fades away was with glory, much more that which remains is in glory. Therefore having such a hope, we use great boldness in our speech, and are not like Moses, who used to put a veil over his face so that the sons of Israel would not look intently at the end of what was fading away. But their minds were hardened; for until this very day at the reading of the old covenant the same veil remains unlifted, because it is removed in Christ. But to this day whenever Moses is read, a veil lies over their heart; but whenever a person turns to the Lord, the veil is taken away. Now the Lord is the Spirit, and where the Spirit of the Lord is, there is liberty. But we all, with unveiled face, beholding as in a mirror the glory of the Lord, are being transformed into the same image from glory to glory, just as from the Lord, the Spirit. (2 Corinthians 3:1-18). This hope would be fulfilled within their very generation when the glory of the Old Covenant had vanished away and the glory of the New Covenant was fully realized after the Holy Spirit finished His work of bringing the church to the full stature of Christ. The glory of the Old Covenant vanished away when death was swallowed up in victory at the coming of the Lord in judgement of Israel. “And on this mountain He will swallow up the covering which is over all peoples, Even the veil which is stretched over all nations. He will swallow up death for all time, And the Lord GOD will wipe tears away from all faces, And He will remove the reproach of His people from all the earth; For the LORD has spoken” (Isaiah 25:7-8). Jesus coming to remove the veil of covering at the end of the Old Covenant age cannot be separated from His death in which He shed the very blood of the New Covenant that would replace the Old. For the eschaton to be in the future and divorced from the Cross of Christ is to have the wrong covenant passing away, and it makes what Jesus died to establish (to give abundant life) to be the very thing that brings death. When eschatology is viewed as being Cross-determined and Cross-centered, however, the picture of God’s scheme of redemption is a picture of continuity and not opposition. Covenant Eschatology does not diminish the role of the Cross in God’s scheme of redemption; it magnifies it! Much credit must be offered to Max King’s book The Cross and the Parousia. While I do not cite any of his statements, the specific language utilized within this article is adopted from his work. The phrases “world above” and “world below” are used throughout the book of John to describe the world of fleshly desires versus the world of spiritual desires – to put it shortly. Some may point to these two passages in Matthew to suggest two future-to-Pentecost comings of the Lord – one imminent coming at the end of the Old Covenant age and the other coming at the end of time; however, while these words are used within this parable, it is in relation to those characters within the parable. The coming of the Lord still takes place within the lives of those involved – the virgins and the servants. To them, the time may seem delayed and a long while, but in relation to God’s scheme of redemption, they were still at hand and soon to come to pass. Here is an example: let’s say a promise is made 4,000 years in the past that an enemy will be defeated. Someone claiming to be a prophet arrives and claims that the defeat of the enemy is at hand. He even says it will be within the lifetime of his audience. The defeat of the enemy really is at hand, but thirty or forty years can also be described as a long while in relation to the short lives of the audience. In terms that we may be more familiar with, think how long it takes that package to get to your house to you, but in reality, it is a very short time in relation to human history.